Model S1, static with public sector, households and private sector. The model can be downloaded here. Right-click and select the option save. NOTE that this model shows a closed economy without import, export and foreign money transfer. 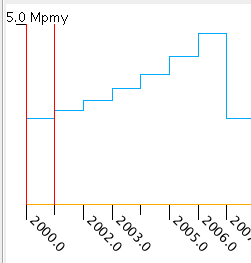 Model S1 Payments and real flows. Time = 2000. Click to see full size. Model S1 shows very basic behaviour of a closed economy. It has a public sector, households and a private sector (firms). Households pay tax and spend money on goods and services produced by the private sector. 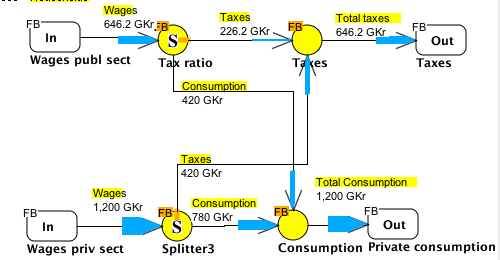 The money (payment) flows are shown to the left and the real flows to the right. 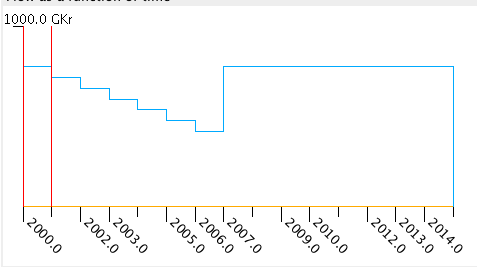 The time axis goes from year 2000 to 2014. 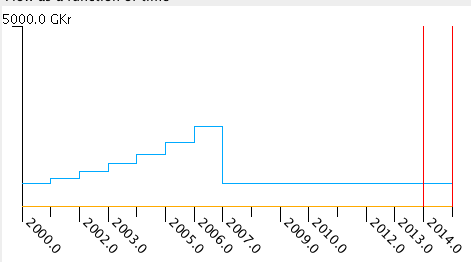 There is really no connection between the years, only a gradual parameter variation. The model does not consider profits and corruption is excluded. There are no flow deviations from the system. Inside the private sector there is a productivity function. The productivity factor determines how many product man years (pmy) are produced by one worked man year (wmy). Productivity function inside private sector. I will investigate a few scenarios. My comments have to be regarded as hypotheses and will be tested by parameter variation in the model. 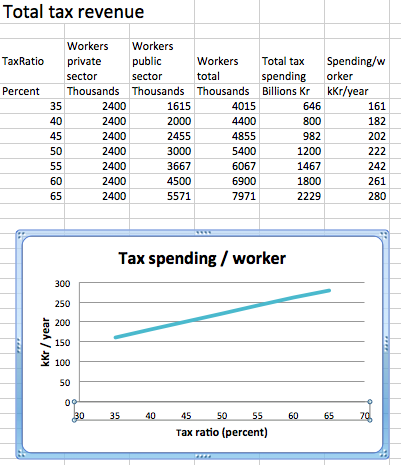 Constant total wages for private sector and increased tax ratio. Most economists say that higher taxes will slow down the economy. I doubt that this has to be the case. Constant total wages for private sector and increased productivity. The common view is that higher productivity gives a higher living standard, better competiveness, less unemployment and more tax revenue for financing the public sector. It can also lead to higher unemployment if the production isn´t increased at the same time. Increased production. This is the most common proposal for reducing unemployment. The assumption is that more people will be employed but we can understand from above that increased productivity can give less labour needs for the same production. Increased production may be desired when there is scarcity of certain goods but too big production can threaten the environment by depleting resources and cause pollution. Shorter workdays. The argument for this is that more people can be employed and the employees retain better health. Wage levels. Wage levels influence income distribution, product and service costs and demand for goods and services. 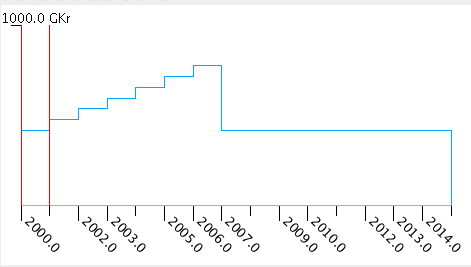 Wage levels interact with prices (inflation) in both directions. 1. Constant total wages for private sector and increased tax ratio. 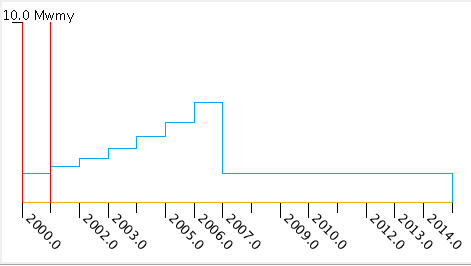 Time from 2000 to 2006 and the tax ratio varies from 0.35 to 0.65. Productivity is 1.0 pmy/wmy. 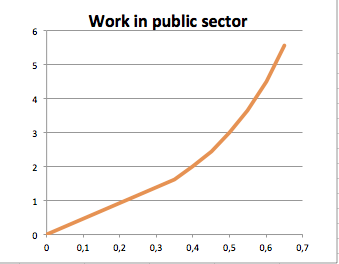 We see that higher taxes (years 2000-2006) give more work (services) done in the public sector. The production in the private sector is constant. More taxes are payed which means more people working in administration, health care, education etc. With the same wage level the total income will encrease. We can look into the household sector and see the distribution between workers in the public and provats sector. The modified model can be downloaded here. Right-click and select the option save. A bigger share of the total production is consumed by those working in the public sector. Those in working in the private sector get less disposable income and consume less. Total consumption of workers in private sector. It seems that everybody gets it worse with higher taxes. That´s why people don´t want taxes. They don´t realise that other people get work and don´t want to share with other people. People don´t think of the benefits they get in the form of free education, health services, social security and pensions. Let us go further and look att the public benefits. We see that more public services are avilable to the population. The choise is between keeping more money for yourself and buy the services or paying more tax and get education, health care and pensions free. 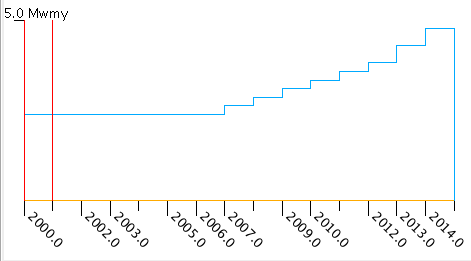 The total money circulating at time 2000 is 1200+646= 1846 GKr/year and at time 2006 is 1200+2229=3429 GKr/year. Where did the extra money come from? The answer must be that they were borrowed. So we need to add a bank to the system. Se chapter Model B1. One measure to make tax increase more politicly acceptable is to increase the production of goods and services from the private sector in order to keep up the private konsumtion. First we look at increased production by increasing the productivity in the private sector. 2. Constant total wages for private sector and increased productivity. 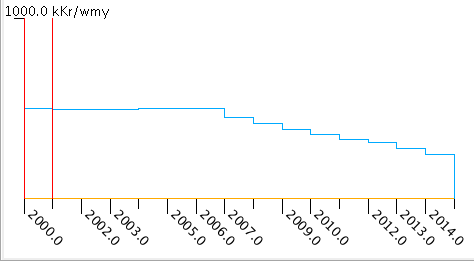 Time from 2007 to 2014 and tax ratio = 0.35. Productivity varies from 1.0 to 2.0. During years 2007-2014 more goods and services are produced in the private sector. The income for all workers are constant but more products are available. Everybody who has an income can consume more for private use to lower prices. Total employment does not change. Every worker can buy twice as much goods and services when the productivity increases to the double. Now we have two options. First: Increase taxes and allow some of the extra production to be consumed by workers in the public sector. More work will be done in the public sector. Second: Keep product prices constant and get more tax revenue for financing the public sector. 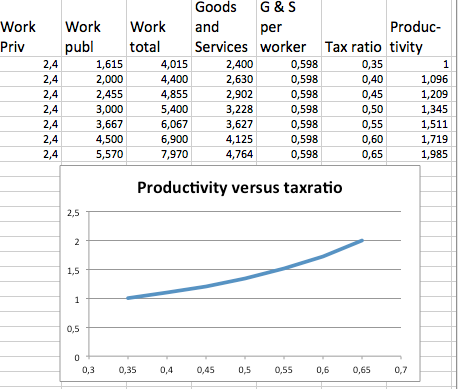 2.1 Increase taxes and productivity. Constant total wages for private sector and constant consumtion in real terms per worker. Increasing the tax ration means that more people can be employed in the public sector and the total number of workers increase. In order to supply the increaing workforce with a constant amount of goods and services per capita, the production has to be increased in the private sector. That means that the produtivity has to be increased.